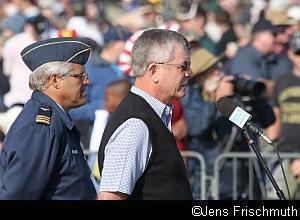 Held on the 12th of May, the Swartkop Airshow was once again organised by the SAAF Museum. 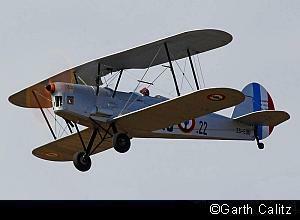 This year's event was called the "Warbirds Centenary Airshow ". 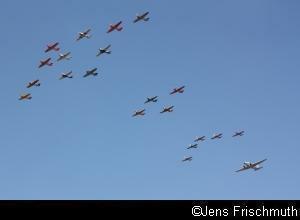 The Swartkop Airshow always offers a great variety of military planes on show. The SAAF Museum operates flying examples of many types of aircraft that are no longer in service and are rarely seen outside of their home base at Air Force Base Swartkop. Added to this, the South African Air Force (SAAF) brought along many of its planes currently in service and various civilian display teams and privately owned aircraft, many of them ex-military aircraft, completed the line up. This year especially, the number of aircraft featured on the programme was staggering. On five occasions, large numbers of aircraft were in the air at the same time and took part in individual or mass formation flypasts. This airshow definitely had the highest number of participating aircraft at any South African airshow in recent times. Power gliders, micro lights, a skydive by the Golden Eagles and an air force band started proceedings, and then the Chief of the Air Force, Lt. Gen. Carlo Gagiano, accompanied by the new Officer Commanding of the SAAF Museum, Lt. Col. Mike O' Connor, addressed the crowd. He thanked the Museum for organising the event and stressed its important role in preserving South Africa's aviation heritage. The speech was followed by a flypast of four Cessna C172s from the Babcock Central Flying Academy. This training school currently provides initial training for SAAF pupil pilots. The aspiring pupils get their first taste of flying in this side-by-side trainer before they continue their training on the Pilatus PC-7 MkII at the Central Flying School at Air Force Base Langebaanweg. Before the first mass formation took to the skies, Pierre Gouws displayed the Aerovodochody L-39 jet belonging to Menno Parsons. Then, an Atlas C4M Kudu, an Atlas Angel (a Kudu modified with a turboprop engine), 2 Aermacchi AM-3C Bosboks and three Piaggio P-166 Albatrosses took off one after the other and performed individual flypasts. 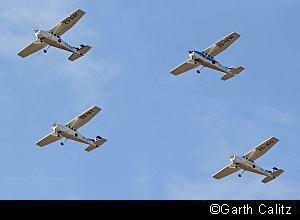 All these aircraft were used for patrol, observation and surveillance duties by the SAAF in the past. Whilst the rest of the aircraft landed, the SAAF Museum Albatross and Kudu did short individual displays. The Goodyear Eagles in their Pitts Specials flew another high-impact routine, which started off with an opposing take-off and continued with many spectacular manoeuvres such as switchblades and many opposing passes. 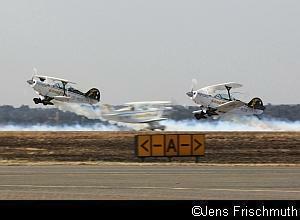 Three of South Africa's top display pilots, Glen Warden, Nigel Hopkins and Neil Trollip, flew for the team on the day. Then, Mike Weingartz flew the ever-popular Atlas Impala MkI. 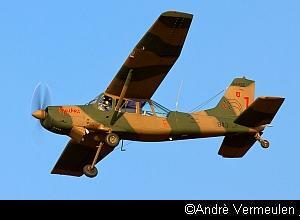 One of the highlights of the event was the now very rare appearance of a Denel Cheeetah at an airshow. After serving as the frontline fighter in the SAAF until their retirement from service in March 2008, most of the planes were put into storage. Subsequently, 10 Cheetah Cs and 2 Cheetah Ds have been sold to Ecuador. Denel Aviation kept two or three Cheetahs flying in South African after their retirement from service and uses them as platforms for the integration of avionic and weapons systems. 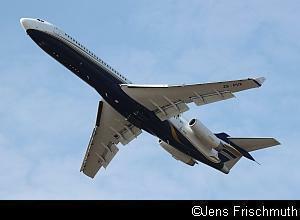 The Cheetah display was followed by a fly-past of the Fortune Air Boeing 727. This plane is configured for VIP transport and is often used by the Deputy President on his trips overseas. The second mass display was made up of 14 aircraft from the earlier days of our aviation history. Two Ryan Navions, four De Havilland DHC-1 Chipmunks, a Stampe SV4-C, an Auster Mk5 and six De Havilland DH82A Tiger Moths took to the skies and performed individual flypasts. One of the Tiger Moths also did a quick solo display and two of the Chipmunks performed a dual routine. 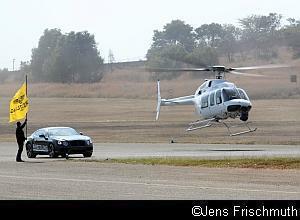 The Breitling car versus helicopter race saw Menno Parsons pit his helicopter flying skills in a Bell 407 against a Bentley. Then, Brad Bennetts flew an excellent display in his Extra 300 and 1 Time Airlines performed three flypasts with one of their McDonnell Douglas MD-83s. The passenger jet performed high and slow speed flypasts and the third pass was done in landing configuration trim. An exciting addition to the South African airshow scene was the first appearance of the North American T-2 Buckeye. 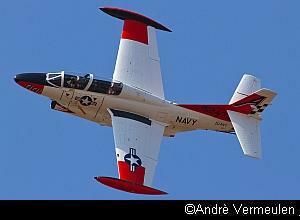 This twin-engined ex-US Navy jet trainer belongs to Ron Wheeldon and was flown by Glen Warden. From 1959 until 2008, the T-2 Buckeye was the US Navy's intermediate training aircraft used to introduce Student Naval Aviators to jets. A total of 273 were built. After the Silver Falcons flew their first display of the day, Col. Rama Iyer showed off the capabilities of the SAAF Museum's De Havilland DH115 Vampire, the first jet to serve with the SAAF. 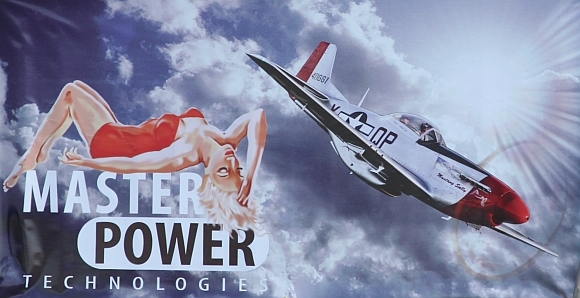 After the display, the Vampire stayed airbourne and was joined in the air by Menno Parsons' North American P-51 Mustang, as both these planes were to participate in the mini-war that followed. The mini-war centred on the re-capture of a SAM site taken over by rebels. 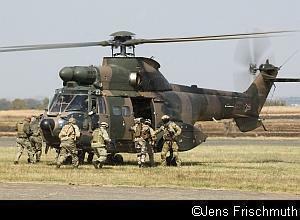 Troops were dropped from a Casa 212 and Puma and Oryx helicopters inserted further troops into the conflict area. The Vampire and Mustang performed various bombing runs in support of the ground troops. Once the area had been secured, the Oryx and Puma extracted the ground troops from the operational area. Immediately afterwards, Menno Parsons did his solo display in the ever popular Mustang Sally. The third mass formation display, the Mass Radial Display, consisted of no less than 15 North American AT-6 Harvards, 5 Yak 52s and a Dakota DC-3. After all the aircraft had taken off and whilst they formed up for their flypast, the four Harvards of the Flying Lions did their full display. After the 21-plane mass fly-past, the 5 Yak52s broke away from the formation and dived on the airfield one after the other in a simulated attack on the airfield. This was accompanied by a spectacular pyrotechnics display by the artillery corpse. After a second flypast by the 15 Harvards and the Dakota, Glen Warden flew a solo aerobatic sequence in one of the SAAF Museum's Harvards. Whilst approaching the crowd from the front for a third time, the 14 Harvards remaining in the formation (minus Glen Warden's plane, which had broken away from the formation prior to its solo display), the planes did a formation break where they broke away from the formation two at a time. Then, it was time for the Harvards to dive onto the airfield one after the other and do their version of the Tora Tora Tora display as well, also accompanied by spectacular explosions and simulated machine gun fire. 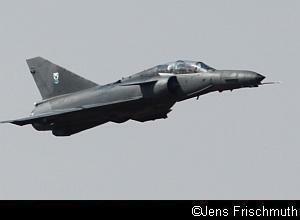 Then the SAAF showed off the fast jets currently in its service. 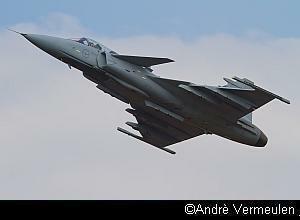 Lt. Col. Craig Leeson displayed one of the BAE Hawks used by 85 Combat Flying School in an impressive display that included a touch-and-go and Blokkies Joubert expertly flew the SAAB Gripen from No. 2 Squadron. Both 85 CFS and 2 Squadron are currently based at AFB Makhado. Thereafter, a SAAF C-47 Dakota TP took skydivers up for a paradrop, three motor gliders displayed their skills and two radio-controlled planes were demonstrated. One of them was a replica of the SAAF Museum's Vampire and the model so closely resembles the real plane that they are difficult to distinguish on photos. The afternoon display of the Silver Falcons was the last public display flown by Team 72. Major Gerhard Lourens flew his last display for the team and he certainly went out with a bang. An impressive fireball accompanied the fan break of the team. After the display, Maj. Lourens landed with his smoke on and when the planes formed up in front of the crowd, his plane was parked in the middle and he saluted the crowd. 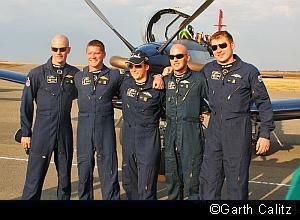 Afterwards, the pilots posed for their last team photo together. Thereafter, the helicopters had their turn. An Oryx approached the crowd from the front and released flares. Then, the mass helicopter display took place. Whilst five different SAAF or ex-SAAF helicopters (a Bk117, Rooivalk, Puma, Alouette III and Oryx) hovered in the background, another 9 helicopters (a Bell 47, six Alouette IIs, an Alouette III and a Westland Gazelle) lined up on the runway. The helicopters on the runway then got airborne one by one and all the helicopters performed individual flypasts. This was followed by individual displays of the Alouette II, Alouette III and Puma belonging to the SAAF Museum. Then, airshow commentator Brian Emmenis made the exciting announcement that ten jets were about to be put in the air at the same time for the mass jet display. After start-up, all the jets taxied along the entire crowd line to give everyone a good view of the aircraft. After taking off, they formed up in three formations. The first flypast consisted of an Aero L-29 flanked by two De Havilland Vampires. 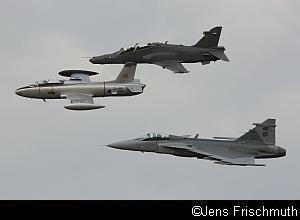 Then, three L-39s and the T-2 Buckeye flew past and they were followed by the third formation consisting of the Impala, Hawk and Gripen. All three groups of aircraft flew past the spectators a few times before approaching the crowd from the front and performing spectacular formation breaks. Whilst the rest of the planes landed and then taxied past the spectators again, the SAAF Museum's De Havilland Vampire, the first jet ever to serve in the SAAF, formed up with the Gripen, the latest frontline fighter in the SAAF. The two jets flew a few circuits in close formation and one of the manoeuvres included a simulated bombing run accompanied by an impressive wall of fire. The last act of the day, performed by The Gabriel Wings Team in their Pitts Specials, ended a very special airshow. The SAAF Museum, led by its new Officer Commanding, Lt. Col. Mike O'Connor, can justifiable be proud of a job very well done for putting together an exciting programme with an amazing array of different aircraft providing non-stop action throughout the day.